Everyone knows that Jeep's roots are in the U.S. Military - the Wrangler's great-grandpappy is the Bantam GPV, which evolved into the Willys MB and Ford GPW during World War II. 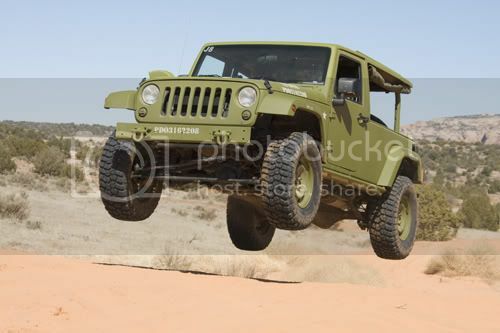 What many people do not know is that the Wrangler's military tradition soldiers on today. The J8 is Jeep's military-prepped version of the Wrangler Unlimited with a heavy-duty chassis, 2.8-liter turbodiesel, and a leaf-sprung Dana 60 rear axle. American Expedition Vehicles has also offered the J8 Milspec Jeep as a civilian version of the J8, sold without an engine so that it can avoid emissions restrictions. The customer can then swap back in its 2.8-liter VM Motori I4 turbodiesel or any of several different versions of the modern smallblock Hemi and register the vehicle as a "component vehicle." JP Magazine happened to love it!